The beautiful pictures of the little girl in the crochet hats had been circulating on Facebook for a few months. The avid crocheter that I am decided to try and make one after being challenged by a friend. However on further inspection the patterns or you tube help available are in Russian! This paper details the methods used to determine the pattern, the sizing, the yarn, the Youtube experience, and most of all a good friendship on the other side of the world. I’d googled the pattern, clicked on the link, found all the info I needed … and then hit the stumbling block of ‘it’s all in Russian’. A few attempts to follow the pattern in Russian were disastrous, ending in lots of undoing. I thought – I can crochet – why can’t I follow what these ladies are doing? Then google found the most perfect link. A lovely lady in Australia (Louise) had worked out the pattern. Off I set with my hook and yarn and made a pretty little pink number. Then I emailed Louise and about the brim – we both played a little bit with the brims (above shows my first attempt), and then I ‘cracked it’ I’m very happy to say! So with Louise and I together we have the hat in English – see the patterns below. Now this is where my scientific nature took over. What good is a pattern if accuracy, reproducibility, and method specifics aren’t written down? Red Haired Amazona – details the whole pattern in her blog here. My method for the brim is found here. The only way to vary the size of the hat is by increasing or decreasing the initial number of double crochets made within the magic ring. The hats do stretch after a few wears – so I it worth bearing that in mind. I’m lucky enough to have a model to try them on for size. The length you need to make the hats before adding the brim (which starts with the 3 rows of SC) is approximately 15 rows of the spiral pattern. As per my pink hat – for a more chunky brim – FPDC, BPDC all the way round. Another alternative for a slightly fuller brim – on the 3rd row of SC add an increase on every 7th stitch. The brims all turn out exactly the same every time when using my link above. 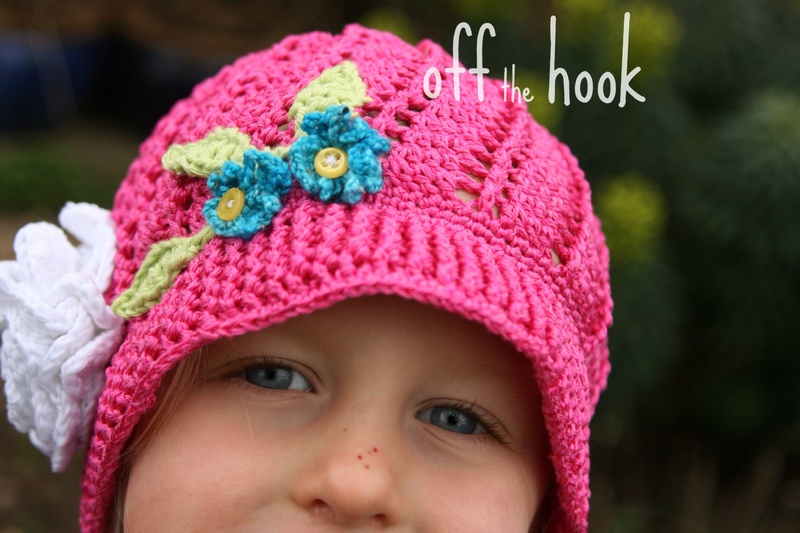 The hat pattern takes 1 ball of Yarnart Begonia – plus little bits for the flower / leaf details. Each hat takes on average 4-5 hours plus then the decoration and sewing together. The yarn choice makes a huge difference to the size of the hats – if using another yarn – please bear that in mind. So I talked about a friendship that has developed as part of my hat journey. It’s with the lovely Louise from Red Haired Amazona. We email/ Facebook all the time about everything from daily life to crochet. We’ve even had a skype chat this week which was an interesting experience with 2 non computer savvy ladies! Having ‘chatted virtually’ for so long to actually put a voice to her was great! So why were we chatting finally after all this time I hear you ask? Well – we decided to share a English translation of the wonderful patterns with you all on youtube! An Ozzie/ English collaboration spanning 1000’s of miles and a good few time zones. I sound incredibly posh (I don’t normally I hasten to add), and Louise’s videos are brilliant at showing you what to do. Do you want to see them? Well here are the links. That picture of the lovely little Russian girl that was on Facebook a couple of months ago and my friends challenging me has a lot to answer for! I’ve been all to consumed by this hat and the patterns, and have woken up in the middle of the night desperate to carry on crocheting to see what they turn out like. I’ve made my youtube debut (after painting my fingernails as I’d just been gardening – they are never normally painted). To film something on a camera phone, use a wine box balanced on top of a breakfast bar with your camera cantilevered in place with a heavy book! I’m learning how to use my ‘proper’ camera correctly. I’ve learnt that my daughter is very photogenic, but she doesn’t look good in yellow (see below). I’m now writing a blog and designing more patterns to share. I’ve found a new yarn which I absolutely adore, so much so I’m now importing it from Turkey to the UK! (get some here). And have made a lovely friend on the other side of the world, that if this little hat hadn’t been made I wouldn’t of ever found. 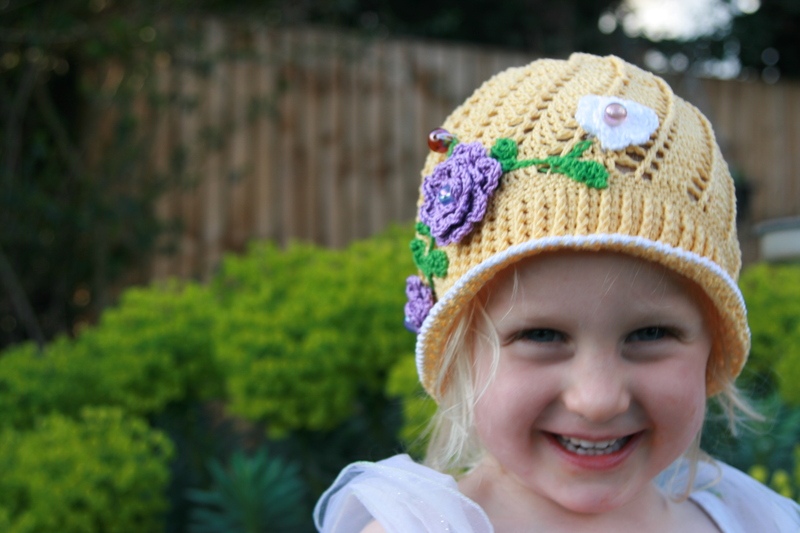 Here are a few of the hats I’ve made along this journey – do you have a favourite? I think the candy pink and light blue have always been my favourites. And the dark blue. And also the yellow and hot pink! How about one in green next? It’s been wonderful collaborating with you! I love your scientific analysis! Try Pinterest – they have thousands to choose from… almost too many as it makes it hard to decide! My circle of friends loves these hats however we are all in our 50’s and would love to make them for ourselves. 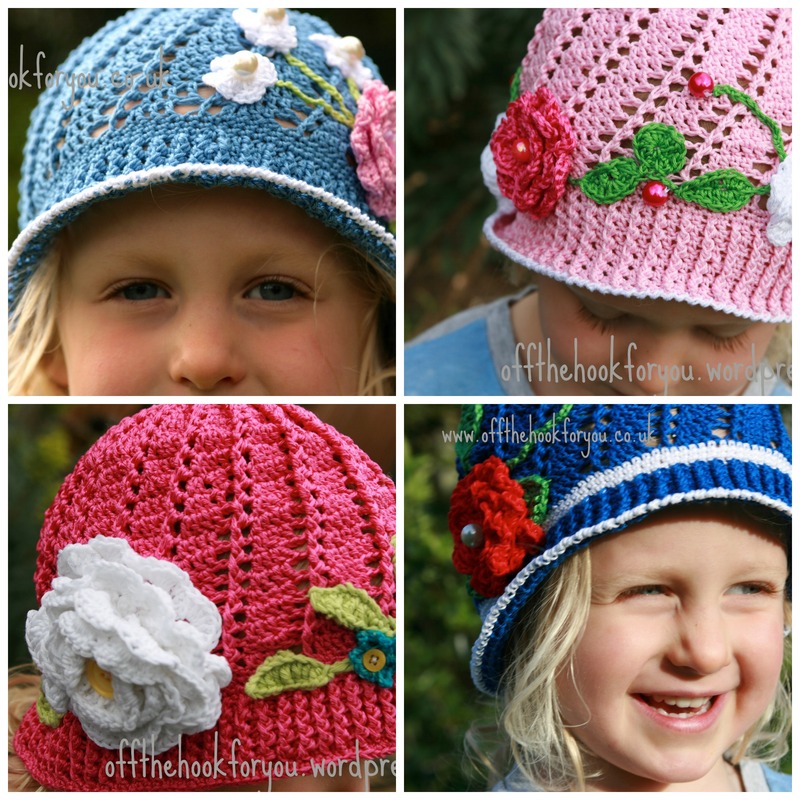 We are all very basic crocheters so would need detailed instructions for adult hats. Any ideas? Hi, Red Haired Amazona has a great tutorial with videos – we did a bit of a collaboration after she’d worked out the hat and I worked out the brim. To make them for adults is really easy – just increase the number of DC/ sections that she describes in her videos and on her blog! Speaking to a few ladies who’ve made them – the yarn you use makes a big difference to size and the appearance of the hat… so much so I bought a lot of Yarnart begonia from Turkey to make them which you can find in my Etsy shop (links in the blog). I have more colours than listed (just haven’t had a chance to add it yet!). 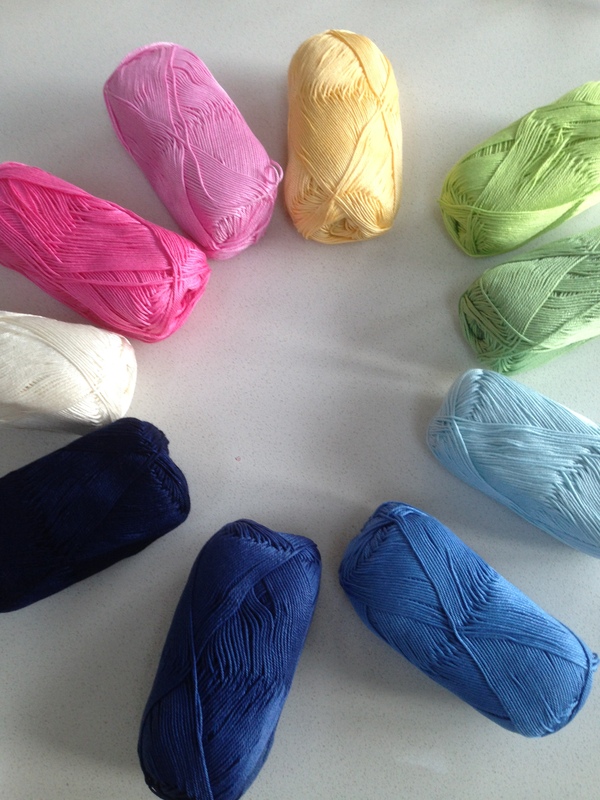 Previous Post A Workshop – Time to learn crochet? Next Post A bluebell wood anyone?